Congratulations to our Boys Varsity Basketball team – they are the official 2019 Diocesan champions! Many thanks to Coach Carlson and Coach Ackerman for leading the team to victory! Congratulations to our Boys Varsity Basketball team! They beat Park last night 43-27 in their first playoff game and will now play St. Stephen’s on Wed., Feb. 13th at 8:00 pm at St. Stephen’s for the championship! Please come and support them if you can. Many thanks to all of the teachers, staff and students who cheered on our team last night! Congratulations to the Boys Varsity Basketball team! They beat St. Mary’s Swormville in the CTK Tournament on Saturday to advance to the finals this Wednesday at CTK at 6:15 pm! 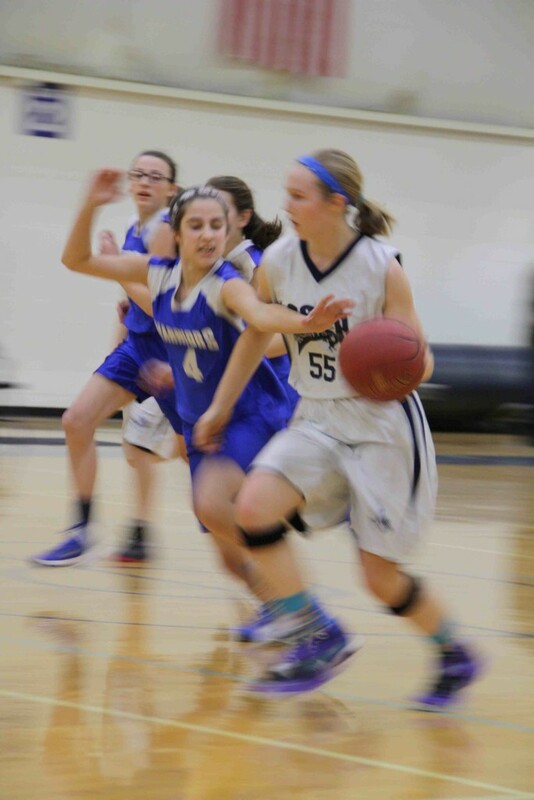 The JV Lady Knights basketball team played a strong opening game Monday night at St. Ben’s. They won their first game 30-10. The team played a fast running game and showed a lot of effort and determination. Our tough defense and strong play on the boards.. made it tough for the Tigers. Great job girls- Way to show up and play HARD! Our Varsity team also won their opening game against St. Christopher’s!! Our Lady Knights are the Champions! They played a great game last night and brought home the Buffalo Diocesan Girls Championship to SSPP by defeating St. Amelia’s 25 to 14! It was an exciting game all the way…with the Lady Knights hanging on to a 17 to 14 lead at the end of the 3rd quarter, they turned up the defense and shut our St. Amelia’s in the 4th quarter while scoring 7 and bringing home the title. An awesome defensive game by Gianna Z and Margaret W helped to free up Caroline C to score 8 points. Riley D scored 7 and Sarah F tossed in a strong 6 points. Down the stretch, Caroline and Riley each made 3 of 4 foul shots to secure the win. With CeCe B, Hannah G, Emily P, Riley O and Lily S coming in off the bench to give the team a rest, they were able to put together a total team effort to bring home the gold! The entire school is so proud of you; with your names going up on the Championship Banner in the gym, you will forever be champions! 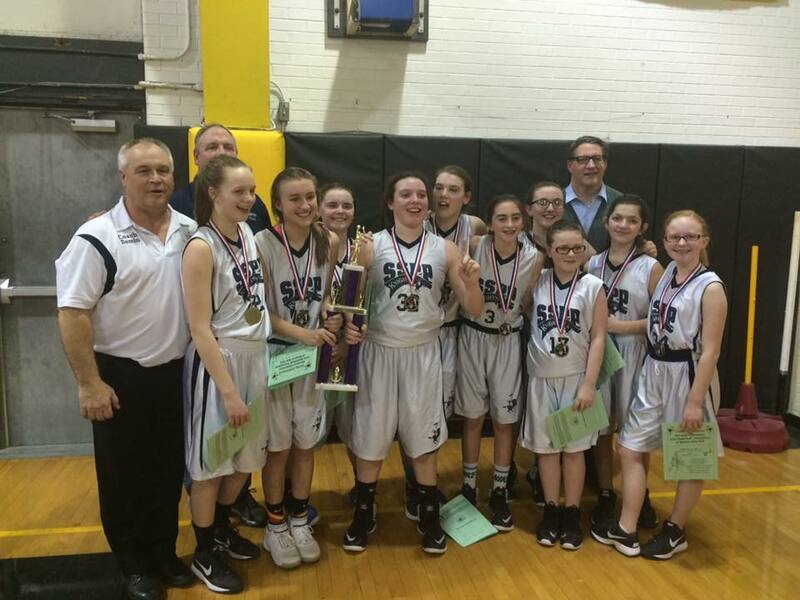 This past Saturday, our Lady Knights scored a victory over St. Greg’s and earned a place in the Buffalo Diocesan Basketball Championship Game! Our girls played an inspiring game both on offense and defense to defeat the Cougars 33-19. The Championship Game will be held tonight at Cardinal O’Hara High School. The Lady Knights will play against St. Amelia’s at 7:30 pm. 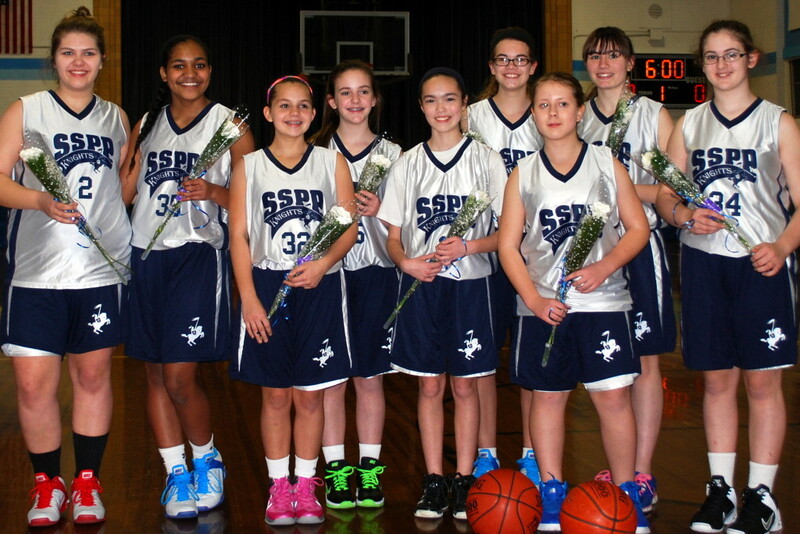 Come on out and cheer on the team: Gianna Z, Margaret W, Sarah F, Riley D, Caroline C, Hannah G, Cece B, Emily P, Riley O, and Lily S as they try to bring home a basketball championship for SSPP! Congratulations to our Girls Varsity basketball team who qualified for the Buffalo Diocesan Playoffs and won their quarter final game by defeating Nichols 35 to 31 Wed. evening. It was a tough game back and forth all night. Down by 2 points after 3 quarters, our Lady Knights turned up the defensive heat and held Nichols to 3 points while scoring 9 to advance to the semi finals. We will play our cross town rivals St. Greg’s this Saturday morning at 9:30am at Mount St. Mary’s High School on Delaware Ave. Everyone is invited to come out and cheer on our team as we go for another victory and a chance at the championship! And just before the game on Wednesday our girls were presented with their trophy for winning the regular season division title in their league. Congratulations girls. We’re all proud of you and Good Luck on Saturday!! Gooooo Knights!!!! 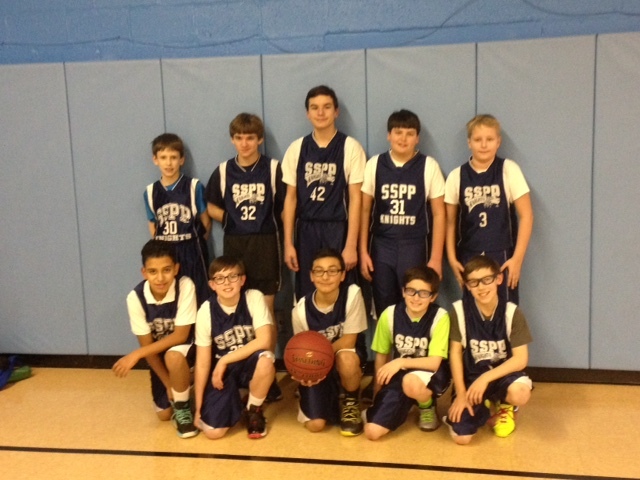 Friday night, the SSPP Varsity 8 boys played against Christ the King. It was a tough game with Christ the King only having 1 loss the whole season.. The Knights kept it close all game…. 4th quarter, tie game 35-35 , 5 seconds on the clock, Bobby shoots and misses, Dominic get the rebound, he shoots and misses, Stephen gets the rebound with 1 second left and drops a buzzer beater for the win!!! Our Lady Knights Varsity Basketball team stayed on a roll yesterday with a strong game against Christian Central Academy, defeating the Crusaders 38-21. With Riley D leading the way scoring 17 points, Sarah F, 12 points, Caroline C, 6 points, and the team’s suffocating defense, it was an all-around great effort. Margaret W, Hannah G, Emily P, Cece B, and Riley O applied defensive pressure all game. Gianna Z was strong on the boards and contributed scoring along with Lily S. Congratulations, girls! keep up the great work! Our Lady Knights continued their winning ways this week by defeating their last 2 opponents at home, St. John the Baptist and St. Mark’s by a combined score of 77 to 36. The team is playing well offensively and defensively and everyone is contributing on both ends of the court. Riley D, 29 points, Caroline C., 16 points, and Sarah F., 12 points, are leading the way. Their league record is 8 and 1 and they are looking good heading into the Mt. St. Mary’s Invitational Tournament and the Diocesan playoffs. he Baptist at the 6:00 pm time sot. 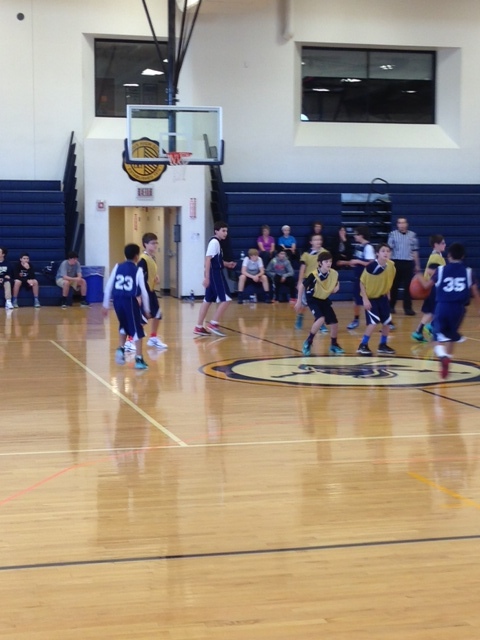 Following the girls’ games, our SSPP 7th grade boys played against our 8th grade boys. 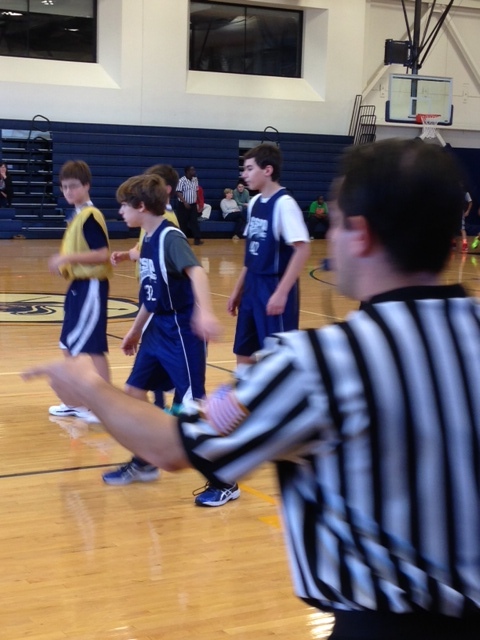 It was a close game, with the final score 28-24 in favor of the 8th graders. A lot of exciting action and great plays! Even our Knight mascot (played by Andrew M) paid a visit and fired up the crowd! Hats off again to our Girls Varsity Basketball Team as they ran their league record to 5 and 0 with a very hard fought 31-18 victory over Christian Central Academy yesterday. Caroline C was their leading scorer; she poured 13 points to lead the way. Riley D had a strong game defensively and also scored 8 points. Gianna Z dominated the defensive boards and also scored 3 points. Margaret W had 4pts, and Hannah G scored 3 to round out the scoring. Cece B, Riley O, Emily P and Lily S all played a great defensive game to help keep our Lady Knights undefeated in league play. Coming up this Thursday, they travel to St. Greg’s for a 6:oo pm game. Our Girls varsity Basketball team participated in the Our Lady of Victory Tournament. The team won its first 2 games by defeating Notre Dame 40-21 and then host OLV 33-15. In the Championship Games, they lost a heart-breaker in overtime to St. Amelia’s 34-31. Congratulations to all of the girls who played very well and to Sarah F and Riley D for being named to the All Tournament Team and to Riley for being the leading scorer with 43 points. Our Varsity Lady Knights were at it again last night as they kept their hot streak going by beating St. John the Baptist 40-12. The whole team is playing well and contributing on both sides of the court. On offense, Riley D had a team high 12 points, Caroline C scored 10, Sarah F 8, and Gianna Z 4. The girls will try and keep the run going with a big league game this Friday in our gym at 8 pm vs. St. Greg’s. Hope you can come out and cheer our Lady Knights onto victory! It’s that time of year again! Our Varsity Girls started off their season last Friday with a victory over St. Mary’s of Swormville. Out Lady Knights played great defense holding St. Mary’s to just 6 points in a 22 to 6 victory. Sarah F and Riley D each scored 10 points in leading the offensive charge. Margaret W played some great defense and also scored a bucket. An all around defensive team effort shut down a strong St. Mary’s team. Gianna Z, Lilly S, Emily P, Riley O and Hannah G all had great games. This past weekend, our lady Knights participated in the Immaculate Conception Winter Invitational Tournament in East Aurora with 11 other schools and brought home the Championship trophy!!! Special congratulations go out to Sarah F who was named the tournament MVP and Riley D who was named to the All Tournament Team!!! Let’s make that 3 in a row for the varsity 8 boys! These boys are on fire! The tough schedule ended Friday night at home with a win against MQA. Way to stay focused! Congrats to the 8th grade Knights! The Varsity boys won their 1st game of the season earlier this week 39-18. Dominic S had 15 points followed by Bobby M with 14 points. It was a whole team effort with a special thanks to assistant coach Mr Hayes! The boys Varsity 8 team won a 2nd straight game against Park School. Stephen W. sunk a few baskets to help with the win 26-14. Gio S. played hard on defense. The boys play again Friday night, 7th grade at 5:30, 8th grade at 6:30 at SSPP! The varsity 8 boys played their home opener against St Mary’s of Lancaster Friday night. The player of the game was Dominating David C. David’s defense was phenomenal along with his hook shot to score a basket. Way to go, David! The 8th grade boys varsity basketball team won the Christ the King basketball tournament last night in overtime against Central Christian Academy by a score of 42 to 35. Ben V scored the tying basket with 10 seconds left in regulation. Leading scorer and tournament MVP Matthew P scored 5 points in overtime to secure the victory. The team also had significant contributions from second leading scorer Derek B, Nick M, Sean M, Garrett Z, Jon P and Peter B. The team won three games in a row to take the tournament. Our Girls Varsity Basketball team would like to thank everyone who came out to support them all year long. · Parents who brought the girls to practices and games – in some of the worst weather! · Classmates who came out to the games to cheer the team on! · Faculty who showed their support throughout the year! You are all greatly appreciated!! They had a great season – winning their league, the Christmas Swishes Tournament, and advancing all the way to the Diocesan semi-finals in the playoffs! To our 8th graders — Lauren S, Haley D and Taty S – you led the team all year and showed great sportsmanship, pride and hustle, and laid a great foundation for the up and coming 7th graders! To our 7th graders – Riley D, Sarah F, Gianna Z, Margaret W, Anna L, Julia V and Lizzy V – you will be the leaders next year to help the 6th graders step in and continue the winning tradition. Each of you have proven you have what it takes to do so! You have worked so hard all year and accomplished so much. It showed in your improvement through every practice and game since we started in November. You should all be proud of your accomplishments. Players, students, parents and faculty – you earned it! Our Lady Knights have done it again! Last night they beat the previously undefeated team from the Elmwood Franklin School with a score of 43-10 to advance to the Diocesan semi-finals and keep their hopes going for a Diocesan Championship. Sarah F and Riley D each had 12 points in leading the Lady Knights charge. Haley D scored 8 points, Taty S with 6, Lauren S with 4 and Lizzy V rounded out the scoring. Margaret W led a strong defensive effort as out team shut down the Elmwood Franklin offense. Gianna Z, Julia V and Anna L all contributed to a strong team win.They continue their charge this Saturday afternoon with the Semi-Finals game at 1:15 pm. The game will be played at Mount St. Mary’s High School on Delaware Ave. Come on out and cheer on our Lady Knights as they drive for the championship! 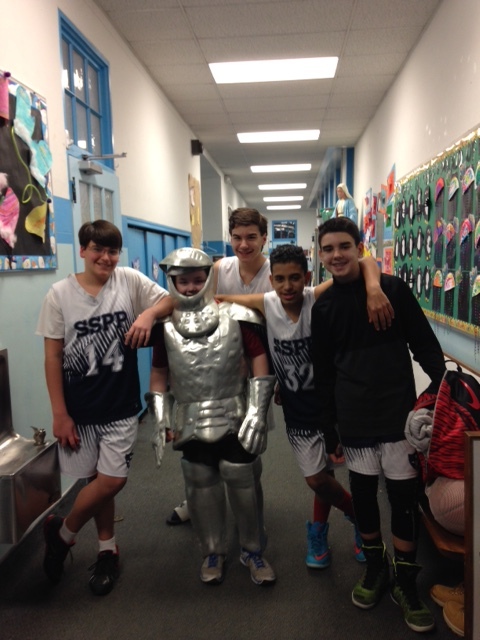 It’s March madness time at SSPP and that means basketball playoffs! Our girls varsity basketball team is in the Diocesan Playoffs and they started off yesterday with a first round victory over OLBS by a score of 27-13! Our Lady Knights came out strong and put the game away early with some pressure defense led by Margaret W, Gianna Z, Lizzy V, Anna L and Julia V. Riley D led the offense with a team high 11 points. Lauren S threw in 6 points, Taty S and Haley D each had 4, and Sarah F had 2. Right after the game, the team was presented with their 1st place trophy for winning the Northtowns Basketball League with a regular season record of 9 and 1. Our Lady Knights play again tomorrow in the quarter finals against an undefeated Elmwood Franklin team. The game will be held at St. Mary’s High School in Lancaster at 7:30 pm. Come on out and cheer your classmates on as they drive to the Championship!!! Let’s hear it for our Girl’s Varsity Basketball team! The Lady Knights captures 1st place in their league last night by defeating St. Greg’s in an exciting games 45-42! Taty S, 18 points, and Riley D, 16 points, led the charge that secured the regular season championship. Haley D and Lauren S, each with 4 points and strong defensive play helped to hold off a comeback by St. Greg’s late in the game. Sarah F and Julia V also scored to help secure the win. The relentless defense led by Margaret W along with Gianna Z, Anna L and Lizzy V all contributed to the big victory. The girls will play in the Mt. St. Mary’s Invitational Tournament and then onto the playoffs where they will continue their quest to bring home a championship!! Congratulations to our Girls Varsity Basketball team who defeated the previously unbeaten team from St. Greg’s last night 41 to 26. Coach Foster put together a game plan that our girls executed perfectly. All the players had great defensive performances. Lauren S and Sarah F, with 3 points each, and Haley D, kept St. Greg’s big players off the boards and limited their shots. Taty S, who had 5 points, and Margaret W led our full court press and forced a great number of turnovers. Riley D, with her aggressive play, took advantage of those turnovers and converted them to 29 points; a team high for the season. Gianna Z, with 4 points, Anna L, and Julia V all had strong performances. It was a real team win last night! Our Lady Knights play again this Friday vs. our other Williamsville rival, Christ the King, at St. Mary’s Swormville at 8:00pm. Our Lady Varsity Knights took on St. John the Baptist last night in basketball and defeated them 32-18 to increase their league record to 4 and 1. Taty S, with 14 points and Sarah F, with 10 points, led their winning effort. Haley D, with a strong defensive showing, helped to shut down St. John’s girls to lead a solid defensive team effort and added 4 points. Riley D, with 2 points, several steals and assists, kept the team moving. Lauren S, Gianna Z, Margaret W, Lizzy V, and Julia V all contributed to the team victory. They will try to take their record to 5 and 1 this Thursday with a home game at 8:30 against St. Mary’s. Come on out and cheer on our Lady Knights! 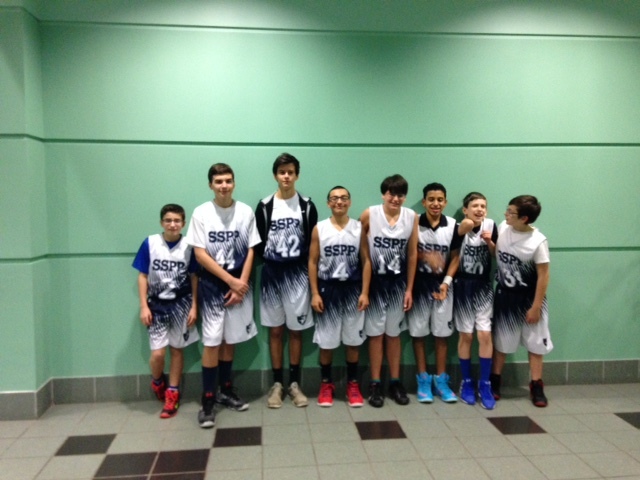 Our 7th grade boys basketball team lost their last game against Mary Queen of Angels on Feb. 11th. Hats off to the boys that came to every game and practice, and kept trying during a tough season. You guys are the real winners and Coach Rob is very proud of you! 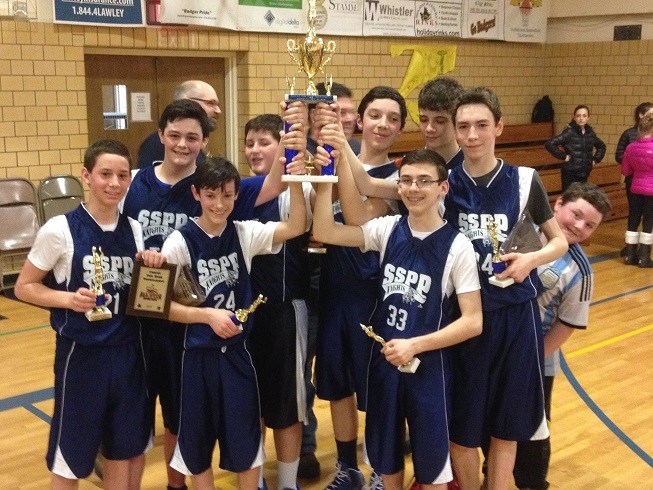 Congratulations to our 7th grade Varsity boys basketball team who played in the St Greg’s Cougar tournament last weekend and came away with their 1st WIN! Bobby M sent the game into overtime with a buzzer beater at the end of the 4th quarter! Every team member played hard and all players deserve recognition; the boys play as a team and win as a team. The Knights beat the Cougars 22-17 in OT. Way to go, boys! Our girls varsity basketball team brought their record to 3-0 with a total team come-from-behind effort to defeat St. Amelia’s 41-38. The game went back and forth, and with our girls down by 6 points in the 4th quarter, they took control of the game. Riley D. led the way with a team high 16 points. Lauren S (2 points) and Sarah F (6 points) dominated the boards and kept our team in the game. Gianna Z, Margaret W, Lizzy V and Anna L all scored and played great defense along with Julia V. With less than 1 minute left, Haley D sank a free throw to put our Lady Knights ahead for good. Then, with less than 30 seconds left, Taty S, with her speed and ball handling skills, stole a pass and scored 2 of her 10 points and sealed the win! 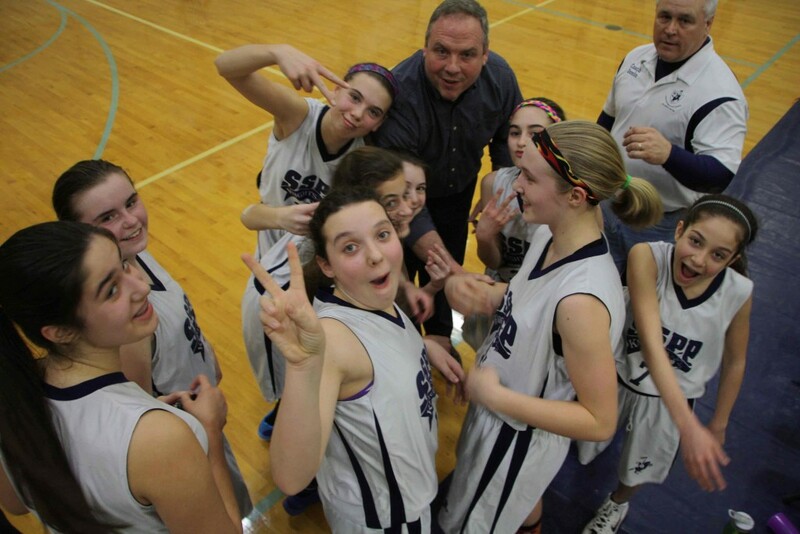 This weekend, our Lady Knights are playing in the Full Court Hoops Tournament at St. Mary’s School for the Deaf. Their first game is Friday at 5:00 pm and the 2nd is Saturday at 5:30 pm. Championship games on Sunday. Come on out and cheer on your classmates and see some exciting basketball. Congratulations to our Lady Knights Girls Varsity Basketball team who started their season yesterday with a big victory over St. Mary’s of Swormsville – 43 to 20. Tatyjana S and Riley D led our team in scoring with 12 points each. Sarah F was strong on the boards throwing in 6 points. Lauren S and Lizzy V also scored in a great team effort. Margaret W led a strong defense along with Gianna Z and Julia V, keeping a very good St. Mary’s team in check. Our team will be even stronger once Haley D and Anna L return from injured reserve! Their next game is Monday, Dec. 8th at 7:00 pm at St. Greg’s. Come on out and cheer on our Lady Knights as they try for another victory! 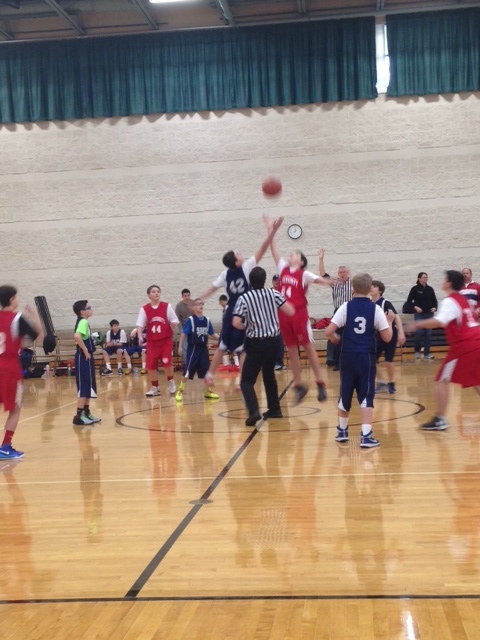 The boys 7th grade Boys Varsity Basketball team began their season by playing in the Canisius High School Tip Off tournament. Unfortunately, they lost 34 – 15 to St Mary’s. With only 2 practices under their belts, the kids played great, however. Joseph made an awesome shot and Dominic dominated in both offense and defense! The boys play again on Sat at 1:00 pm.